Al Muzaffer Shams al din Yusuf I ruled from AH 647 to 694 (AD 1250 to 1295), in this Kingdom in the Southern part of Saudi Arabia. Mint and Mint : Zabid, AH 657 (AD 1260). Size : 25.3 x 25.8 mm. Weight : 1.91 grams. Grade : gVF with a nice strike (only minor weak areas at the edges). Ayyubids of Yeman. al-Mu'izz Isma'il, AD 1197 to 1202. Silver Dirhem. Exceptional quality. Rashulid. Al-Muzaffar Yusuf. AD 1249 to 1295. Islamic Silver Dirhem. Rashulid. Al-Mansure 'Umar I. AD 1322 to 1363. 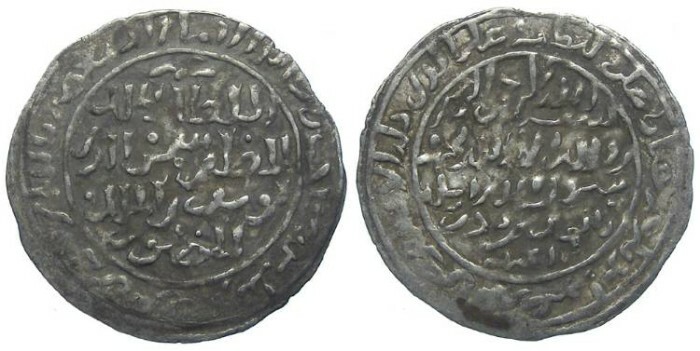 Islamic Silver Dirhem.